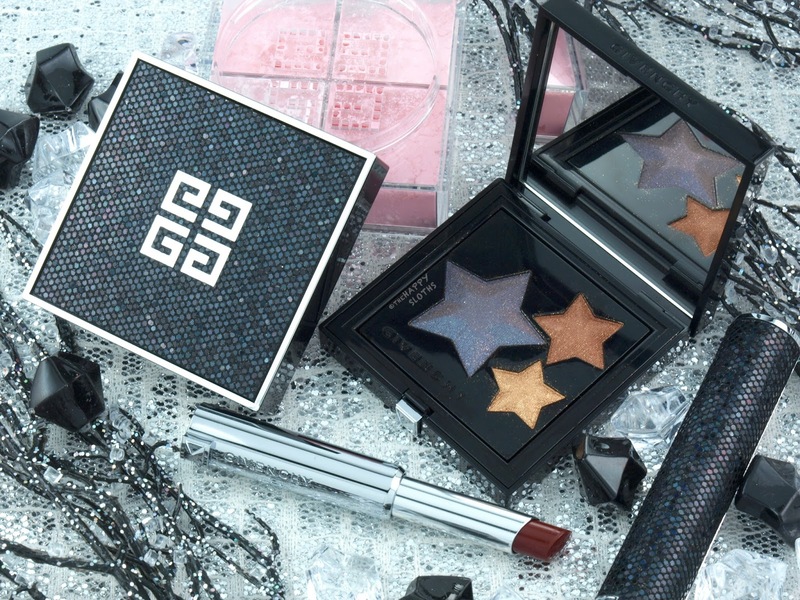 Instead of the classic genuine leather packaging, this special holiday edition features a dark glitter theme. All the pieces are covered in a layer of fine black glitter, on top of which is a layer of what I assume to be hand-placed holographic hexagonal black glitters. The overall design reminds me of a mermaid's tail, but with a vamped up appeal. 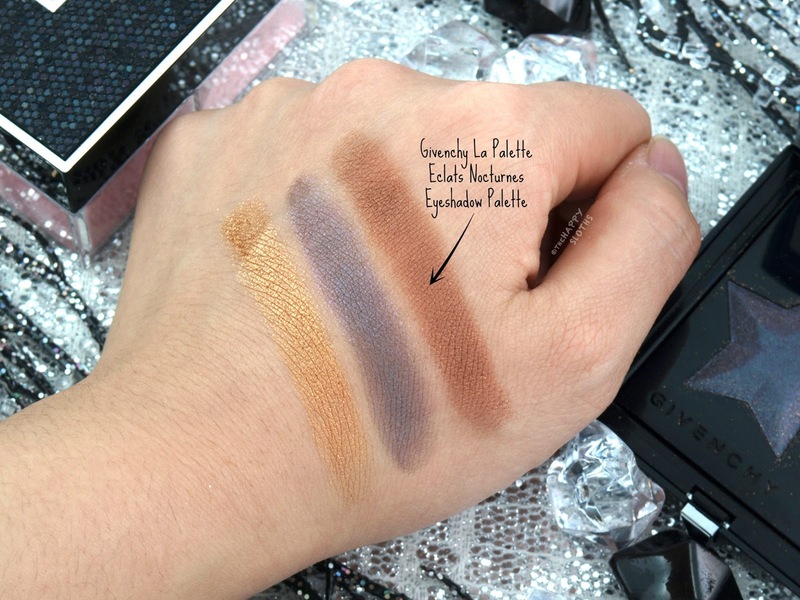 This is a three-shade eyeshadow palette featuring a sheer iridescent navy-gray, a rich sandy metallic gold, and a satin medium brown. 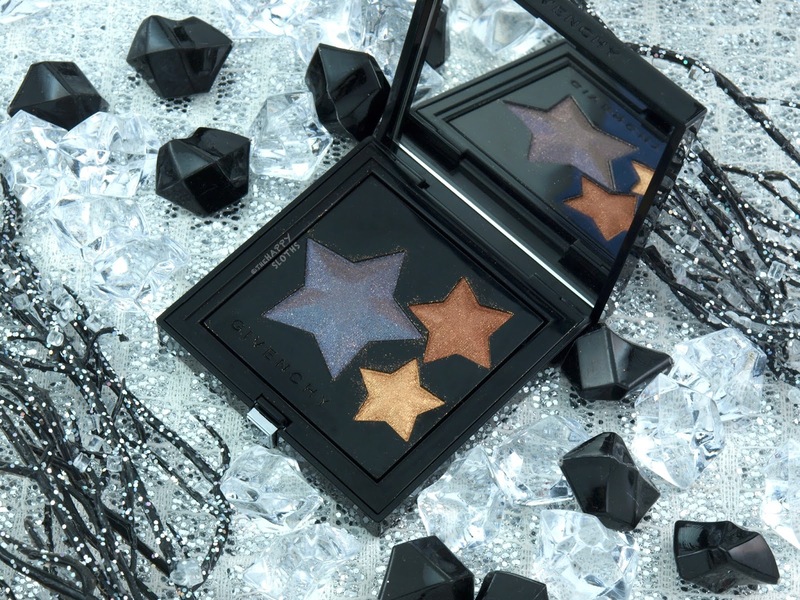 The three-dimensional, star-shaped shadows are sprayed with a thin layer of golden sparkles that wears off after one swipe. All three shades are very silky and creamy in texture. The navy-gray is kind of sheer but the gold and brown are nicely pigmented. 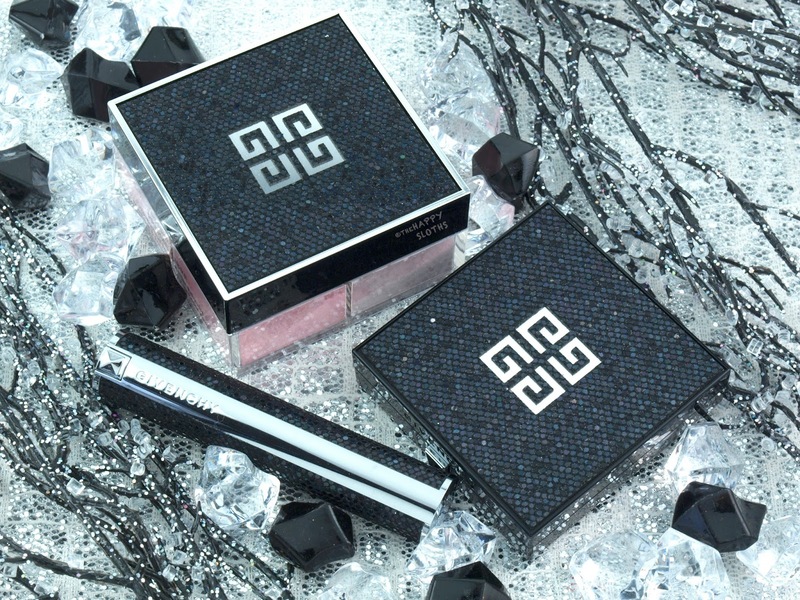 As gorgeous as the packaging looks, it easily picks up shadow smudges and quickly ends up looking a little messy. With that said, I think this is definitely a collector's item so many will keep it untouched for display. 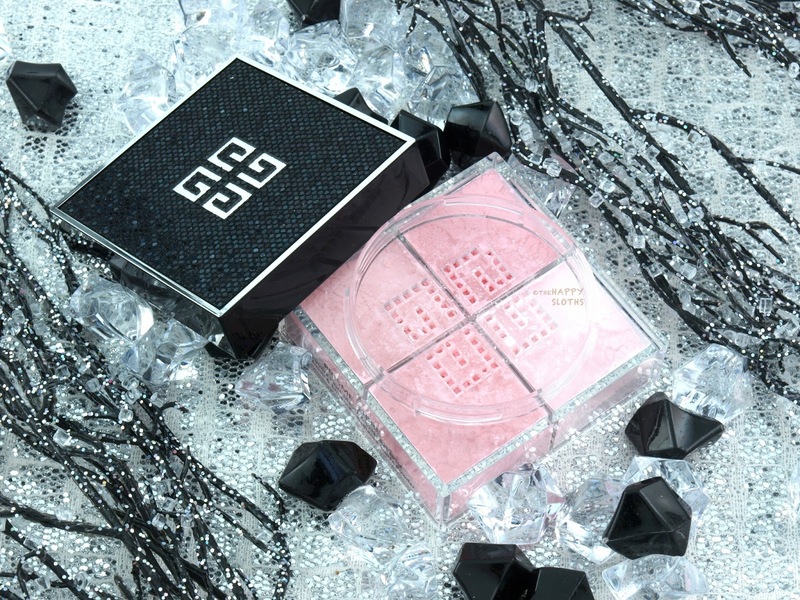 Givenchy Holiday 2017 | Prisme Libre Loose Powder in "09 Eclats de Rose"
Housed in the special Holiday 2017 packaging, the Prisme Libre in "09 Eclats de Rose" is a loose setting powder that combines four gorgeous shades of light pink. 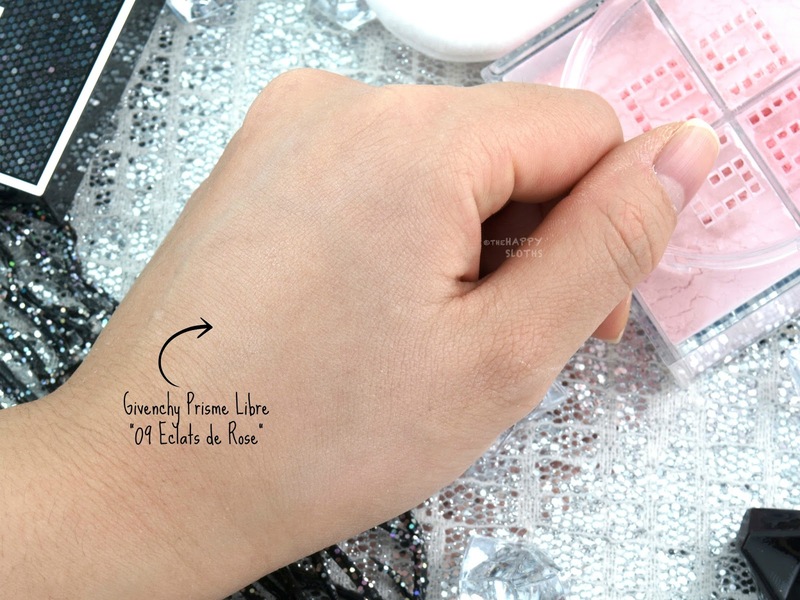 The formulation is silky and finely-milled and although the four colors look almost blush-like, they combine to form a translucent veil with just a hint of baby pink. There are no obvious sparkles but subtle hints of iridescence come through under bright sunlight. The formulation is blurring, mattifying, and very brightening. All in all, this is a lovely version of the Prisme Libre suitable for those with light skin with cool-undertones. 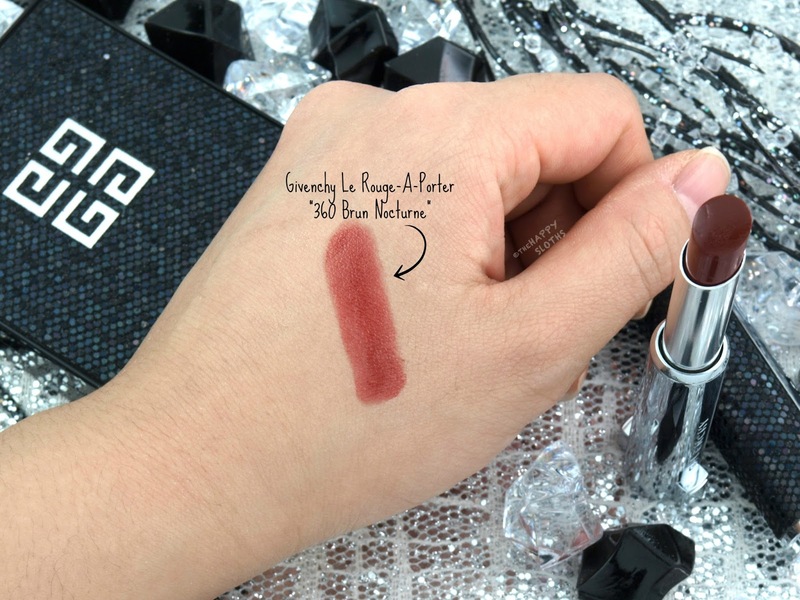 Givenchy Holiday 2017 | Givenchy Le Rouge-A-Porter in "360 Brun Nocturne"
Housed in an updated version of the elegant and slim Le Rouge-A-Porter packaging, "360 Brun Nocturne" is a sheer chestnut red lipstick. The color looks quite daunting in the tube but it is actually very flattering on the lips. 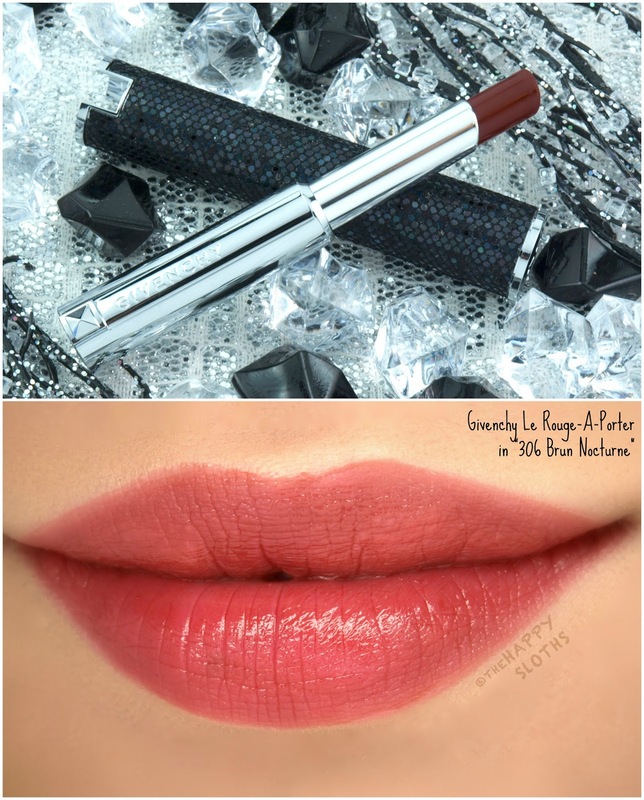 Although sheer, the color applies evenly and the formulation is hydrating and lightweight. Additionally, "360 Brun Nocturne" leaves behind an unexpected pink stain so even when the color fades, your lips will look perfectly tinted. This is a stunning collection! The items are definitely pricey but considering the to-die-for packaging, they are worth the splurge. If you plan on picking up anything, definitely act fast because some of these are already selling out online so check your local Sephora stores for availability!